A few days ago when I went to visit my shelter, there was a big commotion going on. 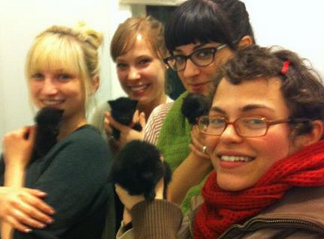 Four tiny month-old kittens had just been dropped off, and there weren’t any fosters available to take them in. Fortunately, one of the staff members was able to take them home and care for them that evening. 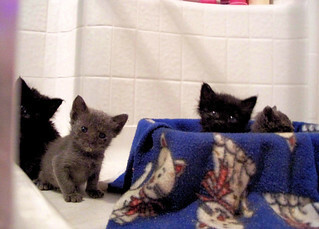 The next morning they would check with their sister shelter to find out if it had any foster homes available. I was lucky enough to help the staff member, a good friend of mine, bring them home and feed them. It was at that point that I realized how much work these tiny lives really required. I only spent a few hours with them, but it grew my appreciation for fosters that much more. The experience reminded me how important it can be for cerebellar hypoplasia cats and kittens to live in foster homes. Depending on their severity, a shelter environment may not be best for them. So, over the next few weeks I’ll be posting some information about fostering. Granted fostering rules and regulations vary from shelter to shelter, but I wanted to supply you with some food for thought if you’ve ever toyed with the idea. If you’re rather green to fostering, that’s fine too. I hope these posts will help you. Fostering means that you agree to take a homeless cat into your home for a predetermined period of time or until the cat is adopted says Jane Harrell, Petfinder.com associate producer. Often shelters foster for a few reasons including: the cat is too young and needs constant care, the cat is recovering from a surgery or illness, shelter life is too stressful for the cat, the shelter doesn’t have any more space or the cat needs socializing. Other times, cats will have special needs that require them to be fostered. Ellie and CG both grew up in foster homes because their respective shelters understood their needs. And why do folks foster? It can be a rewarding experience for many reasons, because you end up assisting an animal find a forever home — and that cat’s future pet parents will greatly appreciate your dedication. If you think you’d like to foster for your shelter, stop by and speak to them about your options. Let them know if you have experience with cerebellar hypoplasia cats — you’ll never know when that may come in handy. Have you fostered? Why? Have you ever fostered cerebellar hypoplasia kittens? Please share in the comments! I’ve also fostered newborns who were temporarily separated from their mother [stupid landlord @%!! ****$@ man] who needed feeding and toileting every 2 hours round the clock, and I can’t emphasise enough that the reason newborns don’t seem to produce any waste is that momma cat eats it to keep the nest clean, but that they need to be stimulated by a simulation tongue [damp towel] to pee and poo because they can’t do it alone. I’ve been amazed how few people, even cat owners, are aware of this. I am the contact person for CH kitties at our shelter. Whenever we get one, they contact me and I come and take it for foster. I then assess the level of severity and what the cat can and can’t do as far as walking, jumping, eating, stairs, litterbox, etc. These are important items of information that you would NEVER be able to assess in a shelter environment. I think all CH kitties should be fostered prior to adoption so that we can better inform potential adoptors of the limitations of that particular cat.